You are currently browsing the Fat Cyclist weblog archives for March, 2012. A Note from Fatty to Weight-Loss Challenge Contestants: The Week 2 Weigh-In has begun! Head on over to this page on the Challenge Forum to post your results; follow the instructions there. Be sure to do your weigh-in by Sunday. If you don’t, you won’t be eligible for prizes this week. Last weekend, The Hammer and I went on a road ride with some friends — Lynette and Cory, along with their daughter Mackenzie — who had just gotten back from an awesome vacation in New Zealand. They had been there to do the New Zealand Ironman, which — due to gale-force winds — had been canceled, with a half-Ironman taking its place the following day. Lynette and Mackenzie went ahead and did the half; Cory watched. “I didn’t have anything to prove by doing another half-Ironman,” he said, which is a completely understandable point of view if you’ve done as many triathlons as Cory. So they hung around in NZ for a couple weeks, enjoying the beautiful country and having an adventure instead of recovering from a brutally difficult race. And this gave me an idea for a new event. I think it’s going to be a huge hit. I think I am going to create a new race, which I will call The Evil Epic 250. I think you’ll agree, it’s an awesome name for a race: it sounds incredibly difficult (it’s 250 miles, for crying out loud! Even hard races only go 100 miles; this goes twice as far as those other so-called epics, which are really nothing more than pretenders. And then, just for good measure, it goes another 50 miles, just to underscore its point) and slightly terrifying (even the race organizer thinks it’s evil, not to mention epic). I haven’t figured out where the race will be yet. Or whether the race will be on dirt or pavement (or both). Those are small details I can work out later. I guess. Whereever the race is, I can guarantee you it will be in an exotic, hard to reach location. One that’s kind of intimidating-sounding maybe, and is perhaps known for its beautiful natives and poisonous, sharp-toothed fish. Oh, and rugged terrain and tall mountains. I’ll bet there’s a place like that somewhere. It’s a big world. The race description — which will be on my professionally-designed website, complete with numerous photographs and well-written marketing copy — will make it clear that this is not a race you take on on a whim. This is a serious race, one that most people could never even contemplate finishing. Even to enter this race — which my site will claim is capped at 1000 elite-level entrants — suggests something about you: that you are an adventurer. A risk-taker. An athlete of the highest order. I will list several professional (and former professional) cyclists who will be at this race, hoping to win (or perhaps take a podium spot) as the crowning moment of their illustrious career. You will register for it. You will register for it, and begin obsessing about it immediately. Before long, The Evil Epic 250 will consume your every waking moment. You will train, nearly non-stop. You will become stronger than you could have imagined possible. Your endurance will be legendary among your officemates. Acquaintances will begin to whisper that you have changed. That there is a new fierceness about your demeanor. A new sort of lust for life. An intensity that belies your hearty laugh and athletic swagger. When you encounter other cyclists and they ask you what you are training for so assiduously, you will tell them, The Evil Epic 250, and they will be so awestruck that they will forget that the reason they asked you that question was so that you would return the question and they could boast about their own upcoming event — their own upcoming event which suddenly sounds quite un-epic and in fact kind of weenie-like. You will find it necessary to purchase special clothing and cycling equipment for this race. You will not begrudge these purchases, because they are things you wanted to buy anyway, but had — to this point — foregone because they were not strictly necessary. The Evil Epic 250, however, gives you a reason — not to be confused with an excuse — to purchase those items. With a clear conscience. You will train with purpose, intensity, and endurance. Each ride will take on meaning. You are not just doing hill repeats; you are preparing for the race of a lifetime. You are not just out on a long, seven-hour ride on beautiful single track; you are building endurance and increasing your technical skills. You are not just relaxing and watching TV; you are recovering. And when you are not training, you will be planning. You will consider every detail, every possibility, and have a strategy that takes it into account. And of course, you will spend no small amount of time telling others of your plans. Don’t worry, people will never get tired of it. Finally, the day of the Evil Epic 250 will arrive. You will travel to the aforementioned exotic, beautiful, far-off place. Or perhaps you will just be planning to leave within the next day or so. Either way, there will be a stunning and tragic development: Due to unforeseen and impossibly tragic adverse conditions such as the biggest tornado in the history of the world, followed by a volcano eruption and a meteor strike that left nothing but a really windy crater filled with lava where the race course used to be, the race has been canceled. Oh, the tragedy! All that work, all that training! And now you don’t get to do the race! “Damn it!” You will swear, and people will know you are very angry, because you rarely resort to such coarse language. Except — deep down — you will be secretly grateful that the race has been canceled, because now you get to have done the best parts of a race — training for it and thinking about it and planning for it — without having to endure the worst part of a race: actually racing it. Outwardly, of course, you will be disappointed, though stoically so. People will admire your stoicism and your philosophical approach to catastrophes. “There’s always next year,” you will say, with a twinkle in your eye. And you’ll still get the t-shirt and finisher’s medal. PS: Secretly, I hope that I’m not the first person who has come up with this idea, and that this is what is actually happening for The Breck Epic. A Note from Fatty About Today’s Post: Between the weight loss challenge stuff (which I think you’ll find interesting even if you’re not doing the weight loss challenge) and the main story in today’s post, this sucker’s long. I recommend you read half today and half tomorrow, because tomorrow (i.e., Wednesday) I will not be posting. A Note from Fatty about the Weight Loss Challenge: The FatCyclist Weight Loss Challenge is now in high gear, with more than 160 people signed up for the challenge, and 130 people checking in for the first week’s weigh-in! And — luckily for everyone — I am not the one who is doing the results tabulating. Because, honestly, it just would never get done if I were. Instead, I’ve asked one of the contestants — Dave V, who makes a living as an auditor and who possesses otherworldly number-crunching skills — and for some reason wants to spend even more time with spreadsheets, to be in charge of that. So now I have, in addition to just a winner to report, actual interesting data to share. The Winner: ClydeinKs lost a whopping 13.8 pounds between his initial weigh-in and the first week weigh-in, making for a loss of 5.62%. Incredible! He’ll be getting a box of Honey Stinger Waffles for that remarkable show of discipline. Which really makes sense, when you think about it. Only someone with as much discipline as this should be presented with a box of Honey Stingers. The rest of us would just eat them all in one sitting. Congratulations, ClydeinKs! The Most Weight Lost: While ClydeinKs lost the most weight by percentage — which is the metric this contest is judging by — Adam_Bowes dropped 14.4 pounds last week; that’s the most total weight lost. Kudos go out to Adam for a remarkable achievement. Boys vs. Girls. Of those who identified their gender, girls won the weight loss challenge this week, losing on average 1.9%, as opposed to 1.64% for boys. Congratulations girls (and boys: I’ll try to not drag you down next week, I promise). Those who did not identify their gender did the worst, with an average weight loss of 1.22%. So there’s a lesson there for you. No, wait. I guess there isn’t. U.S. vs. Them. Contestants outside the U.S. did better on average than those inside the U.S., with an average weight loss of 2.43%. Within the U.S., the Midwest did the best, with an average of 1.85%. Levi Lost the Most: Contestants were asked to identify their favorite pro cyclist. The pro cyclist who lost the mos weight was Levi Leipheimer, who lost 54.4 pounds. Honestly, he didn’t look like he had that much to lose to begin with. The Grand Totals: Of those who checked in after the first week, we dropped from 26,538 pounds to 26,093 pounds: a loss of 445 pounds, with an average weight loss of 1.68%. Not bad for the first week! The Most Random: The lucky random winner of the Twin Six gift certificate is AndersMr8, who lost 3.5 pounds. Nice work! Everyone who is doing the challenge, keep it up. The next weigh-in will start this Thursday; watch for the reminder on my blog then. As the owner of a bicycle, you are no doubt aware of how personal a bike becomes. You adjust the seat height. You adjust the seat position. You adjust the seat angle. You probably replace the seat itself. You swap on your pedals. You change the stem to suit your body length. You adjust the angle of the handlebar, the position of the grips, the brakes, the shifters. You figure out exactly what tires you like best for where you live, and at what pressure you like those tires. So Sure, it starts out as just one of thousands of identical bikes. But as you ride it you make it yours. But — and trust me on this, because I promise it is true — someday you will need to borrow a bike from someone. Maybe you’re traveling. Maybe your bike is in the shop. Maybe you’re interested in getting a similar bike and would like to take a nice, extended test ride to help you decide whether to pull the trigger. These are only some of the possibilities. When you take delivery of the bicycle, it’s important that both you and the person you are borrowing the bike from have a clearly-stated and agreed-upon understanding of your responsibilities regarding the bike. First of all, assure your friend (for now, we’ll assume the person you’re borrowing the bike from is a friend, though — let’s face it — that probably won’t be the case after you return the bike) that you’ll take care of the bike as if it were your own. Although if you’re borrowing the bike because you broke your own by ghostriding it off a cliff, that may not be the most reassuring thing you could say. You may want to provide additional reassurance that while the bike is in your care, you assume complete responsibility for it, and you will return the bike in as-good or better condition than when you borrowed the bike. This will give your “friend” confidence in your upstanding citizen-ness and responsibility and stuff. Which is really great and stuff. You are not responsible for theft. Suppose the bike gets stolen while it’s in your care. Did you ask for it to get stolen? No. Did you take reasonable precautions against its theft? Of course. So is it your fault it got stolen? Heck no. It could have just as easily gotten stolen the last time your so-called “friend” took it out and then went into Taco Bell. Would it have been your fault it got stolen then, too? You are not responsible for reasonable wear and tear. Your “friend” knew you were going to actually go out and ride the bike, right? Like, he wasn’t under some misapprehension that you were buying it so you could take it home to spend the day cleaning and buffing it to a high shine, right? So of course the chain’s going to come back a little dirty. Of course the tires are going to be a little more worn. Of course there’ll be a few new chips in the paint job and maybe some scratch marks from where the rack clamps held on to it. Sheesh, it’s a bike, not a freaking Monet. Again, take these as understood, and do not bring them up until / unless it is absolutely necessary (i.e., when you return the bike). Next, it’s very important you inspect the bike, just to make sure your “friend” hasn’t pulled a fast one on you. Take photos of obvious dings and dents, and make note of any problems that you think your friend might hold you accountable for as new damage when you return the bike. Remember, those bike-lending “friends” can be sneaky, and may well just be out to make a quick buck off you. Don’t trust them for a second. Once you have acquired the bike you will be borrowing, take the time to adjust it properly. You can safely assume that the person you have borrowed the bike from has adequately documented every change he’s made to the bike, so feel free to tweak it to suit your own preferences. First, adjust the seat post. Set it to the height you need. Don’t worry about marking the original seat height; you can be sure that the bike owner took care of that or has recorded the proper height or something. Next, set the saddle up for your preferences. Adjust the saddle angle and position to your liking . Or, better still, remove the owner’s saddle entirely and put your own saddle on. While this negates the months and quite possibly years the bike owner might have put into finding exactly the correct position for himself, you can be sure he’ll have no trouble finding it again. You should probably also adjust the angle of the handlebars. And move the grips or hoods so they fit your hands more comfortably. Might not be a bad idea to change the angle of the brake levers and shifters so they feel just right. Hey, you don’t want to compromise your riding experience. Ideally, the friend who loaned you the bike will come along for the ride. He probably — up until this point — thought it was a really great bike, so this will be an excellent opportunity for him to learn about all the problems it has. I recommend starting the ride by riding the bike into a wall, or the sharp edge of a curb. Just to ensure that the wheels have good structural integrity. Then, once you begin the ride itself, listen very closely for sounds. The brakes might make noise. The chain might make noise. The suspension might make noise. Honestly, since there’s no such thing as zero-friction surface, something is bound to make noise on the bike. Be sure to point it out, and comment that your own bike doesn’t make this noise. It’s probably a good idea to ask — make a serious face as you ask this — if your friend has looked into it. Observe that the cranks are a little “flexy,” because this cannot be proven nor disproven. If you’re buying a mountain bike, pay special attention to the suspension. Especially rear suspension. There wouldn’t be a million kinds of suspension out there if one in particular were objectively and provably the best kind. So, do your homework, then talk about how it kind of bobs a bit. Or that maybe it sticks. Or that the frame seems kind of loose. Believe me, you’ll find something. At the end of the ride, though, be sure to say something nice to the person you borrowed the bike from, so they’ll know how much you appreciate the loan. For example, “Thanks for loaning me the bike” is a nice thing to say. If your friend has the gall to follow up with your generous statement of thanks with a question like, “Well, what do you think of the bike,” have a reply ready: “It’s a pretty nice bike” should be just about perfect. Dont’ say it convincingly, though. And if, for some reason, the friend who loaned you the bike isn’t with you when you ride, be sure to store all this valuable information up, so you can share it with him afterward. He will be very grateful. Clean the bike: Take it to a car wash and hose it down with the high pressure rinse. If you’re feeling generous, maybe do a hot wax cycle. If you got a flat and used the CO2 and tube in the loaned bike’s seat pack, be sure to let your friend know he needs to replace them. If you remember to, I mean. If not, don’t worry about it. If you got a second flat, so now one of the tires is flat, be sure to let your friend know that his tire is flat. As a courtesy. If you break a significant part (like the suspension or the frame) while playing “home mechanic” with the bike, be sure to return the bike when your friend is not home, hopefully under cover of darkness. Oh, and one final tip: if you like the bike you borrowed, try to borrow it again as soon as possible. There’s a reasonable chance your friend won’t have gotten around to messing up the improvements you made to the bike. One of the reasons I love cycling is because it allows me to maintain the self-image I prefer, as opposed to the one I really ought to have. Before The Hammer was The Hammer, she was The Runner. And yet, she was not just a runner. She was a cyclist, too. She started cycling long before she and I got together. Indeed, she was an accomplished cyclist, having completed Lotoja (a 200+ mile race) and The Leadville 100, multiple times. But — and I say this with all the humility a beloved internet celebrity cycling superstar can say without seeming falsely humble or perhaps even condescending — I was a better cyclist than she was. Yes, I was both faster and had more endurance. She and I both knew who the alpha rider was, and that was me. So anyways, sometimes we’d go on rides together, and I’d push her a little bit, for a long time. Not in a huge way, mind you. No, more in much subtler, insidious ways. Or — much worse — I’d be relentlessly cheerful. No matter how long we had been out, I always had something nice to say about the ride. If a big climb was coming up, I’d talk about how much I like climbing. If we were in the flats, I’d go on about how there’s nothing for endurance and power like turning the cranks over and over in the flats. If I was exhausted, it was a good exhaustion. This kind of behavior, I am sure you will agree, is not annoying at all, to anyone. And so I was incredibly surprised when, at the top of a short-but-painful climb, I turned to tell her how amazingly cooked I was and how much I love cycling for the way it can leave you completely ruined, when she spoke first. As a man who knows when a woman is not kidding around even a tiny little bit, I put a sock in it. But honestly, I did not get it. I had not been anything but pleasant during the ride. She had no reason to suspect that I was going to say anything offensive or mean or anything. Hey, I’m Fatty, for crying out loud. I never say anything mean or offensive. So why was I riding with a metaphorical sock in my mouth? What had I done wrong? It’s no secret that, as a wonderful person who wants to be supportive of his wife, I have tried to take up running. I believe I have documented at least a little bit about how well that’s gone. For example, I’ve talked about how I totally crushed the Death Valley Marathon. And how I just flew when running the 2010 NYC Marathon. And then there was the Ogden Marathon, where I discovered that I’m more than half an hour faster if the course is downhill. And now, in (much!) less than a month, we’re doing the Boston Marathon (The Hammer is doing it because she’s fast and qualified to run it, I’m doing it as part of Team LiveStrong). So I’ve been running again. Training for another marathon. I remember an exquisite sense of humiliation. A couple weeks ago, we were doing an 18-mile training run. Around mile 12, I started slowing, and there was nothing I could do about it. I tried speeding up, but simply could not. In fact, at mile 13, The Hammer changed over to a walk. “Why are you walking?” I asked. “Because you’re running slower than I walk,” she answered, without irony. And it was true. I was taking run-like steps and making a run-like motion with my arms, but I was going at a pace so slow that any mallwalker would have gapped me. “Just go on,” I said. And I really meant it. The Hammer is the fastest she’s ever been right now — she’s really stepped up her running game lately — and I didn’t want to hold her back. I remember despair. We started running again, and — before another mile had gone by — the strangest sound came out of my mouth: something that sounded remarkably like a sob. I was surprised by the sound. Not that a sob-like sound had come out of me, but that I had somehow let this sound — that so accurately represented how I felt — escape. I stifled it before another could come out. “What was that?” The Hammer asked. And I looked down and away, because I didn’t want her to see that I was crying. That I was totally beaten. We agreed she should go on ahead and finish the run, then come back and get me in a car; meanwhile I would try to get as far as I could. When The Hammer picked me up, I was at mile 16. I have never been so happy to give up in my entire life. What is my point? An easy, simple, short one: I think running has made me a better cyclist. Which is to say, a more understanding cyclist. Before, I had been riding for so long that I had honestly forgotten how it feels to be completely, truly beaten by something. To be so tired and sore that you start taking it personally. You don’t feel an interested, ironic amusement at your tiredness. You feal destroyed. It’s good — once it’s over — to be reminded exactly how hard something can be. Oh, hi there! I wish I had time to write something good today, but I don’t. Which is too bad, because I’ve got a good topic I want to write about and everything. Which, when it’s winter and there isn’t a lot of riding to be had on a daily basis, is not that common of a thing to come by. The thing is, I have a regular old job. And that job — like many jobs — gets pretty intense sometimes. And lately it’s gotten pretty intense a lot more often than it used to. Almost as if they want me to work for my pay or something. The nerve! Anyway, this is going to be a shortish post, and mostly interesting to people who are in the weight loss challenge. So, if you’re not in the weight-loss challenge, you might as well stop now and go read something else. Like maybe Dug’s blog. Or Rich Dillen’s. Oh, and while you’re there, do me a favor and leave a comment that has nothing to do with the post. He’ll like that, I’ll bet. If you’re part of the weight loss challenge I started last week, you’re either at or coming up on your first week weigh-in. Just click here to go to the Week 1 Weigh In topic and follow the directions. Should only take a minute. Everyone should post their first week weigh-in by Sunday evening. If you don’t, you’re not eligible for prizes this week. And not all prizes necessarily go to the biggest loser. Sometimes there’s a random prize, so even if you didn’t do great this week, you should definitely still post. PS: Having been in a conference room with treats all over the place, as well as lunch being brough in all the time, I lost only two pounds this week. I’m at 171 even today. PPS: I’ll be back Monday posting that thing I would have posted today if I had time. If I don’t forget what it was by then. A Note From Fatty For People Who Forgot to Get Themselves a FatCyclist.com Jersey : Maybe you forgot to get in on the pre-order. Or maybe you’re new to the blog. Or maybe you weren’t thinking of flying the Team Fatty flag before, but now you are. 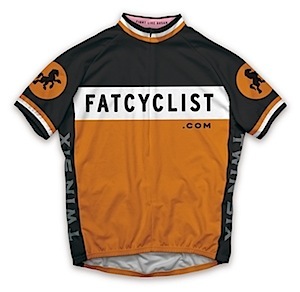 For whatever reason, you didn’t get yourself the heart-wrenchingly beautiful 2012 Fat Cyclist jersey. Well, now’s your chance to fix that problem. My good friends at Twin Six have just received a very limited number of Fat Cyclist jerseys, in both men’s and women’s sizes. With a 3/4 hidden zipper, the “WIN” slogan in pink on the back, and a classic look, this is definitely a jersey you should get. If you haven’t got one already, I mean. Today, I’m pleased to announce that Paul has already replied to me, with some terrific advice and useful tips that I plan to get around to reading (along with his other letter) while I’m on the plane to Portland. But that doesn’t mean you shouldn’t read it right now! Once again, I appreciate the time and effort you’ve put forth in producing such a long-winded and unnecessarily in-depth letter. As before, let me stop everything I am doing right now, so I may address your latest set of concerns. I suggest you possibly wait until you have a more substantial role (or several) under your belt before worrying about a Hollywood agent. Yes, your stardom… while I understand your concern that such limitless fame may be distracting to the others on our show (the Oscar-winning movie star, the polarizing character from FRIDAY NIGHT LIGHTS, one of the most well-known British comedy actors, etc., etc.) I don’t think we can “step up” security anymore than already exists – which I assure you is more than adequate for your intergalactic notoriety. Um… yeah. Let’s go step by step here. Slowly… the actors most likely will have no reason, nor interest in making eye contact with you. Especially after I have a meeting with them the day before you arrive, which was not on my calendar, but certainly is now. As to approaching you, again, I am sure they will have no trouble restraining themselves during their 12-hour work day. As to your personal assistant… unfortunately, I cannot provide you with a personal assistant. I was going to lend you a Garmin GPS for your rental car, but now that may be off the table. You will just have to deal with handling all things Elden on your own during your ONE day of work. We at Leverage apologize for any inconvenience. As to not remembering the actors real names and/or calling them by their character names, I would suggest the best way to eliminate this potential problem is to simply not speak to them. At all. For any reason. Ever. Not once. And now one of my favorites — your concern about hurting Timothy Hutton’s feelings. Yes. Let’s see… while the idea of you walking onto our set with your arms full of evidence of the vast array of awards you’ve won — and let’s not forget your site stats! — is quite intriguing to the dark, vengeful, laugh-when-someone-trips side of me, I would recommend against it. Our sets are filled with lights and cameras and actors and crew members and that leaves very little room for your awards and stats, especially considering the incredible volume of said awards and stats. Thus, if you leave this cornucopia of acknowledgements at home, there should be no potential fallout from our Academy Award-winning actor’s feelings being hurt. Excuse me for a moment while I step out of my office for some air…………………………… okay, thank you. As to your request for a trailer larger than all our actors put together, I am unable to grant such a request without first sticking a gun in my mouth and blowing my front derailleur out the back of my cassette. And let me take this opportunity to say thank you for accepting my generous offer to have you on the show with so much humbleness and sincerity. PS – do you happen to have Bike Snob NYC’s number?